Basically i replaced the original driver side pillar with a full 3 pod gauge pillar with tweeter cutout, the problem is the "tweeter cutout" does not include the original protective mesh/grill that covers the speaker hole, attempts to remove this one from the original pillar resulted in the cheap plastic mesh/grill splitting in two. Anyone know if mitsubishi sells these tweeter covers as standalone parts and if so what would be the part number? im working on getting an image. Any info locating this part number would be great. Last edited by Bster13; May 21, 2009 at 08:27 AM. I am looking for the part number for the banjo bolt for the coolant line for evo 8 turbo. I cant find it in the part # list. I am looking for the rectangular plastic cover, that covers a hole in the dash in the middle of the air/defroster vent. I was running a wire and i accidentally dropped the small cover down the same hole and I can't find it. Its about 0.5''x1.5''. I believe the number is right on the bottom of the piece but I forgot to write it down. Thanks for any help. I am looking for the part number for the 2 screws which mounts the front bumper to the chassis behind the plastic coverings of the bumper as per the circle in the picture. 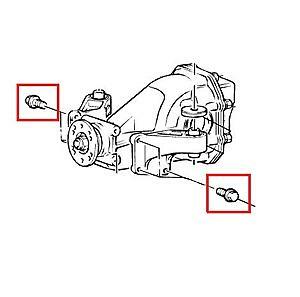 Could you please provide me the part number for the differential bolt(s) in the picture below? I need these ASAP. Im looking for the HVAC decals for an Evo 8.
just did the evo ix front bumper conversion and need the part numbers for the retainer clip and cap back (snap the front bumper to the fender area) as well as the upper left and upper right reinforcement plates. 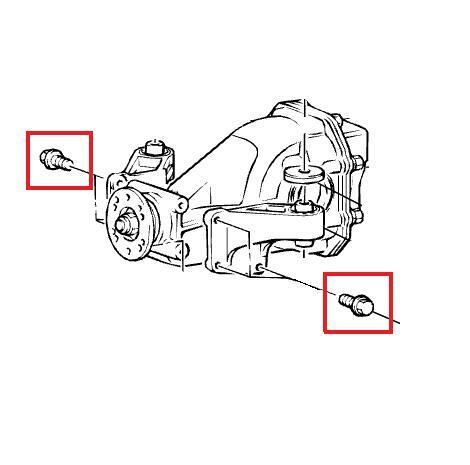 Need the part number for the bolt and nut that hold the lower front ball joint to the knuckel ( pinch bolt and nut) . Hey russell, I bought some center caps recently from there and when I went to go have them put on, the shop told me they were the wrong ones? I don't get it. I ordered the ones you told me to. I can give you my order number and information but I really need these exchanged because I paid 50 dollars for these things. I would greatly appreciate it if you could help me out with this matter. I'm trying to find the P/N for the gasket where the j-pipe and the compressor housing meet (evo 8).